The city is letting government parking placard holders sabotage its own street safety efforts. DOT says it's up to NYPD to keep placard holders from parking in this crosswalk, where an NYPD placard-holder was parked Tuesday. Placard abusers will be given free rein to park in a recently created no-parking zone that’s supposed to improve pedestrian safety at an Inwood crossing. 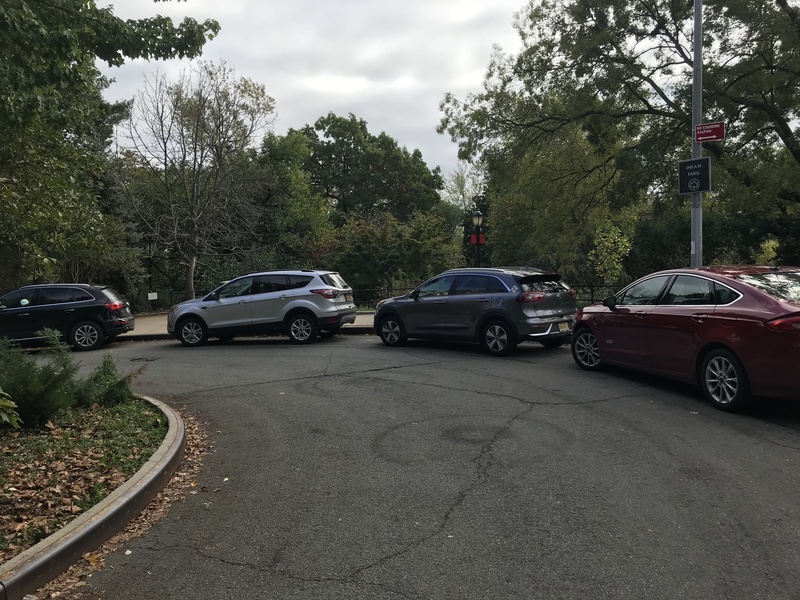 DOT upgraded the unmarked crossing at Seaman Avenue and W. 214th Street, between Inwood Hill Park and Isham Park, over the summer. As part of the project, a curbside parking spot on the east side of Seaman was converted to a no standing zone to make people crossing the street more visible to motorists. Naturally, city employees with parking placards soon began storing cars in the no standing zone. A Human Resources Administration staffer was directed to stop parking a city-owned vehicle there after Streetsblog brought attention to it. 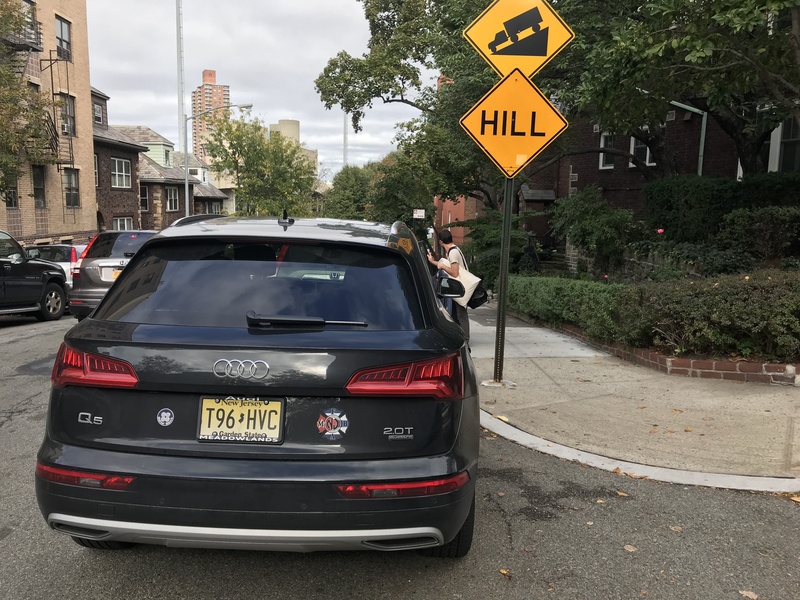 But that only cleared the way for other placard abusers to commandeer the space, like the driver of this SUV with a 44th Precinct placard, who was parked there shortly after dawn on Tuesday. In practice, the placard system is less about facilitating government business than enabling government employees — or anyone with an NYPD hat or vest on their dashboard, for that matter — to ignore rules that are supposed to keep crosswalks, bus stops, delivery zones, and other areas clear of motor vehicles. Despite lip service from Mayor de Blasio about cracking down on placard abuse, a New York City parking permit remains a license to park virtually anywhere without fear of getting a ticket. The situation at the Inwood crosswalk shows how the placard system is directly at odds with DOT safety projects. To speed up implementation, DOT often employs low-cost materials, like road markings, that placard holders know they can disregard with impunity. So rather than helping people cross the street without being hit by a driver, a daylighting zone becomes a de facto reserved parking spot for anyone with a placard. Despite multiple documented incidents of illegal parking in the short time since the project was completed, DOT has no plans to fortify the new Seaman crosswalk with flex posts or other physical barriers to keep drivers out. Because getting police to discipline their own always works out. If you want to make the point well, you really need a better photo, showing the issue. DOT: The buck stops… somewhere else. Why can’t DOT just put bollards around no parking/no standing zones? That would solve this placard abuse problem in a heartbeat. While they’re at it put them around police stations also so the police can’t park on sidewalks. cost. both for installation, and for replacement when a driver inevitably hits them. not a satisfactory answer, but that’s it. I see plenty of these (VAS, clergy, some union somewhere, bail bonders, doorman, etc.) that abuse the system too. This vehicle also has a pending ticket for speeding in a School Zone on 20 September. I’m not so sure about that. This site gives the average installation/purchase price at around $300 per bollard ( https://www.shug.com.au/bollard-pricing-and-cost-guide-by-shug ). Let’s even say it’s $500 because everyone charges more in NYC. You have 6,000 miles of streets. We’ll play Devil’s advocate and assume for a moment you need bollards on both sides of every street spaced maybe 4 feet apart. That’s 1320 per mile and 12,000 miles, so 15.84 million bollards. At $500 each, the total cost would be $7.92 billion. However, you won’t need bollards everywhere. I’d say worst case you need them in corners, on some streets with heavy pedestrian traffic, etc. Maybe you need the equivalent of 15% of the total, so about $1.2 billion. Moreover, you install them when you pave a street. With streets on at least a 10 year cycle for paving, that’s $1.2 billion is spread over 10 years. This comes to $120 million a year, which is a rounding error in NYC’s budget. It cost more than that to add 1,000 cops we didn’t need. I’m sure we can find enough things to cut so DOT can put bollards where needed. Also, bollards generally don’t need repair unless a heavy truck hits them. They even have bollards strong enough to withstand that. It’s a given that the NYPD won’t ever enforce rules of placard parking since they’re among the biggest abusers. That leaves physical deterrents as the only way. Steel and concrete is the best policeman. ^ The real reason the PBA hates speed cameras. NYC DOT’s highway budget is $277.8 million. so $120 million is a lot. like we need photo proof to convince us that an NYPD placard vehicle was illegally parked. Good piece on a disgraceful situation. STREETSBLOG NYC: please consider a piece on the need for a residential parking permit system in NYC. Out of state vehicles are 10-20% of those parking for free in Inwood. Add to that a not easily counted but likely substantial proportion from suburban NYS counties and the potential curb space to reclaim for residents who need to own a car and for pedestrian safety and cycling infrastructure is large. During a recent Columbia football game, many out of state cars cruised for free parking and others were parked illegally. Giving away free parking to commuters and visitors encourages driving and is unfair to residents. https://uploads.disquscdn.com/images/595b85da53fa2902a7445905be064892fd62345a7f4e7959133ea25ef52f15bc.jpg https://uploads.disquscdn.com/images/37d787067f732141b8ab5b1d5096ff1270ece577f1a0e1a747b90fb3f90e2f15.jpg Albany, Boston, Philly and DC all have Resident parking permit systems. Why not here?
? This is why the Department of Transformation needs a cement mixer. It won’t fly because it’s so valuable yet we give it away for free. I wish we had sensible pols who recognize the value of our public roadbeds. That still leaves $150 million or so for elevated bikeways, AMIRITE Joe R.
Seriously, DOT spends way more than $277.8 million just seeing the amount of street projects they do. Here ( http://www.nyc.gov/html/dot/html/about/about.shtml ) it says the operating budget is $900 million along with a $10.1 billion 5-year capital program. Add bollards to that capital program. It would be a small percentage increase but offer a large return in lives saved. While we’re add it add that $150 million annually for my elevated bike lanes. At perhaps $5 million per mile, that would be 30 miles per year. In 5 years we’ll have a nice system. In 10 years you’ll have one within a mile or two of most people. Usually DOT requires a “maintenance partner” for sanitation (sweeping, trash removal) purposes. I, for one, heartily endorse granite boulders. Many hydrants in Inwood have placard holders parking overnight at them. Totally illegal, placard or not, but since there is no enforcement at night nothing is done about it. This is the 34th precinct, who ate too busy being paid off by La Marina to enforce parking rules. An out-of-the-way no parking zone next to the Inwood Hill Park playground has become a hotbed of public space theft.